Windows Phone 8.1 has brought about many improvements in terms of features and functionality; but unfortunately, the native Music app isn’t one of them. Windows Phone 8.1 makes XBox Music the default music player, and though it brings about some of the most requested features – like playlist management – it is more of a step back than forward. Users around the world have complained that this app “killed music” on Windows Phone. And why not? Some of the most basic playback controls are not up to the mark. Take for example the Now Playing list; it can only add a limited number of songs to the queue at a time. Well, this might not bother you much, unless you have a huge music collection and want to shuffle through the entire library. If you have a large music collection on your Windows Phone, two things about XBox Music will definitely annoy you. First, the music app takes a lot of time to load your entire music collection for the first time. And second, that little shuffle button in the corner is almost useless. On Windows Phone 8, tapping on “songs” and selecting any one of them to play, would automatically queue up your entire music collection to in the “Now Playing” list. Instead, now on Windows Phone 8.1, the “Now Playing” list will only contain about 100 songs from the beginning of your music library; and shuffling through such a small list doesn’t make much of a difference than playing in sequence. Microsoft announced that it would be releasing bi-weekly updates to improve its XBox Music app, though there was no official word on fixing the above issue. We are all waiting for an official fix; but in the meantime, here are some workarounds you can try out to make your music listening experience better on Windows Phone 8.1. As it turns out, Microsoft has not entirely killed the old Windows Phone 8 Music hub; and it’s still lurking around somewhere within Windows Phone 8.1 (at least in the Developer Preview). You can revive the old Windows Phone Music app with the help Music Hub Tile. Music Hub Tile is just a regular app in the Windows Phone; but once you pin the app to your Start screen, tapping on the tile will take you to the familiar gray-white interface of Windows Phone 8 Music hub. And of course, here shuffling works exactly as before: select any track from the songs list and the app will add random tracks from your entire music collection to your Now Playing list. Download and install Music Hub Tile to your Windows Phone. Launch the app and pin the Music tile inside the app to your Start screen. Now press the Start button (Windows Key) and tap on the newly pinned tile. The Windows Phone 8 Music Hub will be launched. Play random songs from your collection and enjoy listening! This one’s for Nokia Windows Phone users. If you need to shuffle through your entire music library, using Nokia MixRadio is another good option. 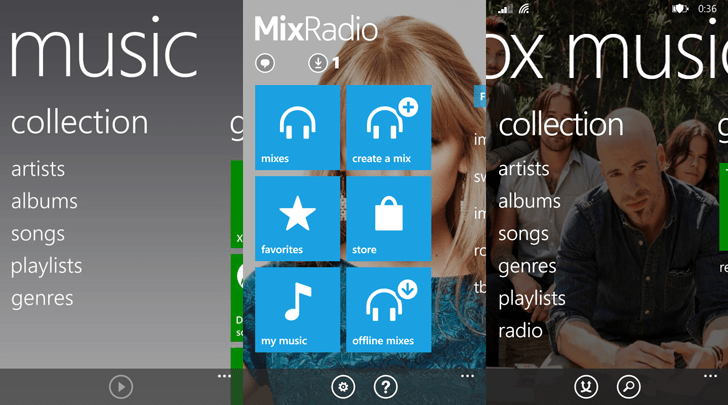 Though MixRadio is better known for its personalized mixes, it can also play your local music content. And just like the old Music Hub of Windows Phone 8, you can randomize songs from your entire music library by tapping on a song in the songs list and then turning on shuffling from the player screen. Download and install Nokia MixRadio. After the app launches, swipe right to the second screen and tap on My Music. Swipe to the songs list and select a song to play. On the Player screen, tap on the Shuffle button in the top right corner. That’s it; now listen to random songs from your collection as it automatically plays for you. The XBox Music app in Windows Phone 8.1 can shuffle only through a limited number of songs. But with a small trick, the music listening experience can be improved in a way that randomizing songs might just work. Although, you can load only a limited number of songs in the Now Playing list, this little trick will add random songs from your entire collection to the list, rather than adding them sequentially. You can now be sure that your shuffled Now Playing list won’t contain only songs from the initial part of your music collection. So if you don’t want to use a different app for playing your music, this is the one to go for. Open the XBox Music app on your Windows Phone device. Swipe right to the “collection” screen. Here, instead of tapping on songs, tap on the small shuffle button at the bottom of the current screen. Congratulations, your Now Playing list will now contain random songs from your entire music library. Tap on the List icon in the “now playing” screen (the one at the bottom-right side of the album art) to view the Now Playing list for confirmation. These are a few ways to shuffle your music on Windows Phone 8.1. If you know of any other way of doing the same thing, let us know via comments.